Sepulchral Guard & Hi, atus! First update in a long, long time… What’s changed? Well, first things first: The missus and I bought a house! We moved in a few months back and are finally getting somewhere with furnishing and decorating the place. The house will be 100 years old in a few years. and was renovated by the company that sold it to us, which meant most of the hard work had already been done, but still… Moving house simply isn’t fun! However, I finally have a dedicated hobby room. I’ll be showing it off in a future post I think, but the obvious comforts I can tell you of is that I now have a lot more room for storage, and a modest gaming table that doesn’t need to be dismantled at the end of each wargames gathering (which, having moved somewhat closer to most of my gaming compatriots, won’t be as few and far between as before). On the subject of my hobby work: I have continued to paint a good amount of models, too much to mention in this post. I”ll do a round-up post at the end of the year with some thoughts and ponderings so you can catch up. Now, on to some models! Like many people I have fallen into Games Workshop’s latest man-trap, namely Warhammer Underworlds: Shadespire. The models are awesome, the price is attractive, and the game is said to be fun – I haven’t gotten round to playing yet. These undead sculpts I have freshly painted are simply superb, as you can see. Over the last few years I have collected and painted a number of undead models, mostly to use in Frostgrave (hence the tombstone-turned-treasure marker). However, I have begun using a unified palette for all of them so that they can be used together for skirmish games such as Dragon Rampant and the like. For this reason I have also opted to use regular 20x20mm bases – you never know when that WHFB nostalgia swings around again! You’ll notice the distinct green hue to all the colours. I started from a bone-coloured undercoat spray, and after block painting all the colours I washed the models all over with Coelia Greenshade, and the silver parts with a second wash of Drakenhof Nightshade. After that I started highlighting the colours back up again. In this manner I ended up with a very cold-looking colour scheme. I’m especially satisfied with how the bone came out – it’s recognisable as such, but nowhere near the standard type you see on most models of the type. The one thing I’m not 100% sure about is the fur on two of these models. I might go back over it with a select drybrush to try and turn it a little more grey. Not sure yet. Well, in closing, I hope this post will still find some readers! I haven’t looked at this blog’s page hits or subscribers in a long, long time, so who knows… It was as lively as a graveyard in here. And on that stupidly apt remark, I shall take my leave. Tah! 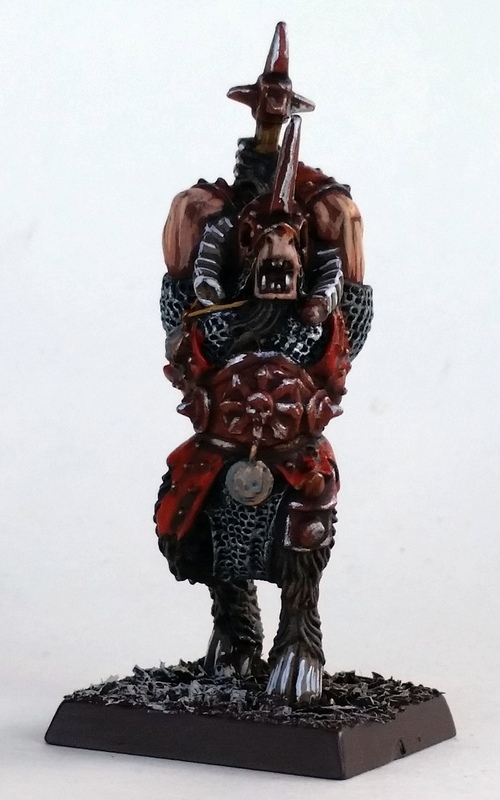 While recently rummaging through a couple of boxes in search of something entirely unrelated, I happened upon a Beastman model from years back. As you might have surmised already, something deeply nostalgic began to tingle in my gut – reminiscences of trackless hours hunched over plastic GW crack, slaving away with paints like elf flesh, blood red and the iconic vomit brown. In the end I decided to place this man-goat in between my current historical work and, at last, here he is. First off – if it were any other GW model I’d have left him in that box, but with a pose like that you can’t say no. To me, this model is a perfect illustration of GW’s heyday. Back in the mid-2000s they were bringing out sensible plastic kits but still recognised the value of white metal for character models. They still had actual sculptors working for them instead of today’s lazy underpaid manchildren with an Autocad degree. I can’t help but think that a lot of the commitment to making great models is lost when the sculptor no longer has the actual 3-up in his hands to connect with – it’s a bit like the ethical discussion regarding army drone operators, albeit with less dead civilians. Painting-wise, it’s a bit of a hybrid in that I used as many of the old GW range as I had lying around, but had to make do with using several of the new paints. For example I’ve used the old macharius solar orange for the orange armour plates, but washed them with the newer shades. I think it came out slightly darker than before, but overall I’m pleased with the effect. I’ve also decided that the old skin tones are flat out better when unmixed; dwarf flesh is much more vibrant than cadian fleshtone and kislev flesh is too light of a tone for final highlights as opposed to elf flesh. 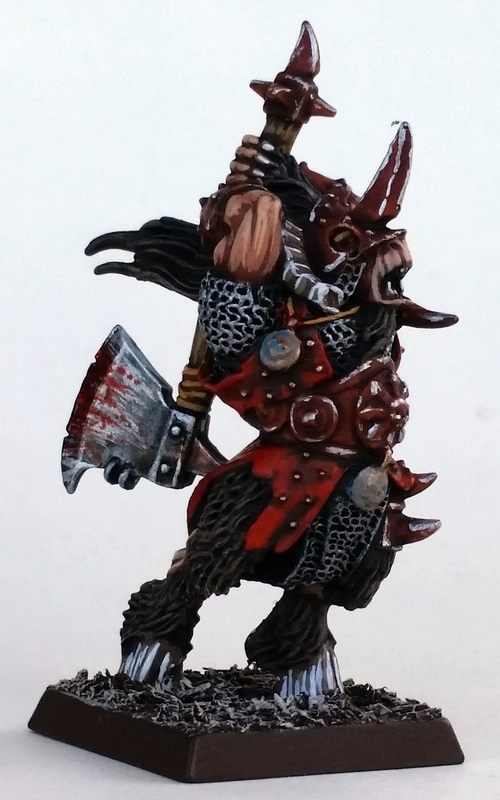 Hence I’ve used the old range skin tones on this model. One problem is that I’ve managed to misplace my huge bag of yellowy-looking static grass, so I currently can’t finish the base. Still, it’s playable at the moment, so I’ve no qualms about that bit of detail. It’s a shame that ‘playable’ no longer means a thing, though, because Warhammer Fantasy seems to have completely died down in my gaming circles. Years of mismanagement on GW’s part, with the End Times as the final (overpriced, gold-trimmed) nails in the coffin. We’ll have to see how the next edition will pan out. That’s it for today! I have another update ready for you tomorrow, and it’s going to be an even bigger shocker than this one… So check back soon, dear readers, and adieu! Among the models my friends brought back from Salute for me (at no charge, as they were paid for by my commission painting service!) were the final crucial models for my Flemish warband. 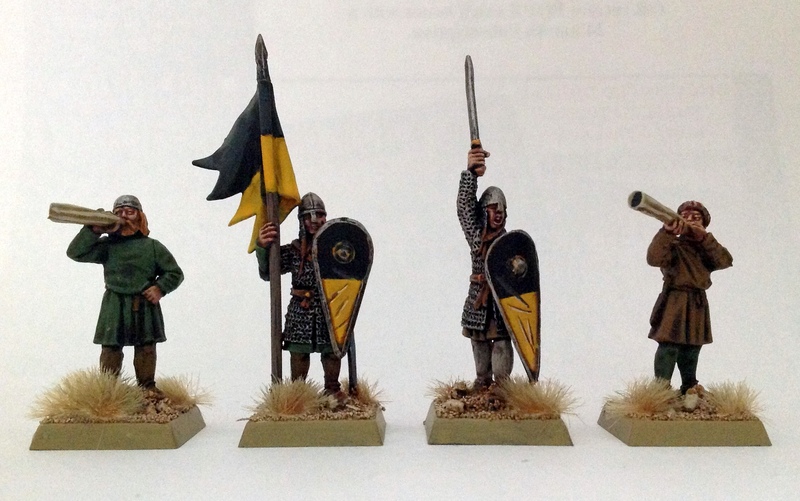 I say “crucial” because while I have many other suitable models lying in boxes that could be added to the army, I needed the models below to field a Flemish Saga warband – one with Hereward the Wake, Flemish mercenaries and the Anglo-Danish battleboard. While I actually have the official Hereward model lying unpainted, I figured a more 11th century look would suit my warband better, and so I arrived at the foot command standing pack from Perry Miniatures’ early crusader range. The two models at the front are Perry Miniatures, the ones at the back are Conquest Games plastics. 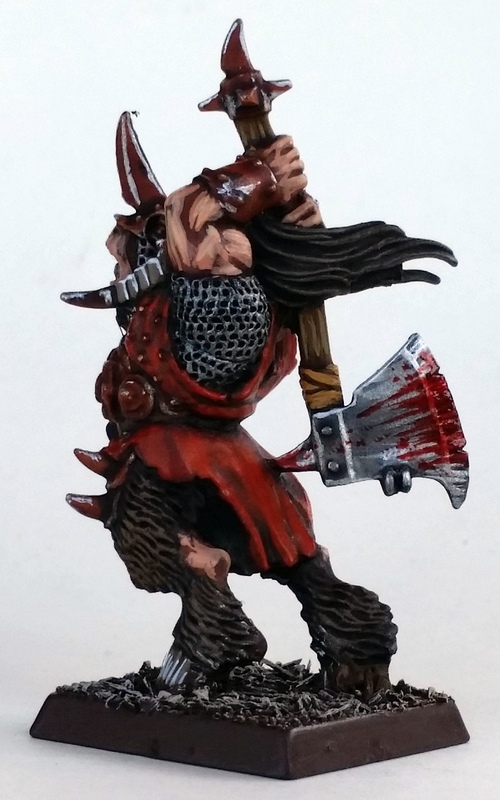 I based the guy on a 40x40mm square base together with other models, so that he can also be used for non-skirmishing rulesets as a command stand within units, as well as for Warhammer Fantasy. Behind the commander and his standard bearer are two plastic Conquest Games Normans, just to fill the base out. The scale difference is noticeable, but I’m okay with it. Four more Perry Miniatures models. I also painted up the other models from the pack, while I was at it. As you can see I’ve used a much simpler heraldic device on these guys; I have plans to expand this army further, and having to paint dozens or even hundreds more lions would drive me mad. I’m probably going to vary the shield designs between units, keeping to the yellow-and-black to still firmly identify them. Here’s another blog post, and a very important one, too! With the last batch of Rus Princes cavalry (pictures will follow) I have crossed the 500 model mark – to be precise, I’ve painted 504 models this year, and so my vow of a minimum of 500 models has been achieved – And we’ve still another month to go! Let’s do a little retrospection and see what got us this far. I’ll sum it up per project, then relate to you the future plans I have with each of them. Vikings: At the end of 2012 I’d already done some of the Gripping Beast plastic viking hirdmen; in fact, much of my warband was already finished. Still, this year saw about a hundred additional models added to this army; mostly plastics from the new Gripping Beast Dark Age warriors set, but also a decent slab of metal models both by Gripping Beast and Old Glory. In 2014: Finish what Vikings I have lying around, and follow up with a few loose purchases at Crisis 2014 to fill out incomplete units. Particularly, I’d like to build a Northumbrian client contingent using the box of plastic Anglo-Saxon Thegns I have around, and also a mercenary unit composed of Jomsviking models. Dacians & Sarmatians: This is an army I’d like to complete in 2014 and then move on to other projects. I started off with a box of Sarmatian cataphracts at a convention last March, and with a little effort the army will be done by the same time next year. This year I painted the aforementioned cataphracts (with an extra blister of them to bulk them out), two small units of light cavalry, the command models, and a Dacian warband – by the end of the year I’d like to complete a second warband. So in 2014: a further unit of light cavalry, a falx warband, and a unit of noblemen. There might be some plastic models left over which might be used for other purposes (Viking berserkers, notably) or to convert to javelin-armed skirmishers, but these are low priority. Greeks: The unwanted child of my Crisis 2013 impulse purchases. I bought two boxes of Victrix models and I’m currently at 1/12th of their contents painted. In 2014: This is a relatively low-priority army and will probably receive rather sporadic attention. I have nothing other than armoured hoplites to paint for this army and there’s nothing non-hoplon armed to paint for variety. I will probably get about half done over the course of next year and then plump for the new Greek kits from Victrix at Crisis 2014. Arabs: I painted an entire Arab warband for Saga at the beginning of this year, nearly 50 models in all, and they haven’t received any love in quite some time. A shame! This is mostly due to the Saga Arab list out of Wargames Illustrated being somewhat bland. Still, I consider them finished at the moment. In 2014: with the Crusades supplement for Saga probably available at Salute 2014, these might leave the cupboard once more. I have eight light horsemen left unpainted, and depending on the nature of the battleboard I might do these up as well. Dutchmen: Plumped for a box of Swedish infantry in May when Warlord held a deal on them, and received a box of cavalry in August as payment for commission painting. Nice models, but the lack of interest amongst my gaming associates means that I don’t have much impetus for this project. In 2014: Left to be done are a company of shotte and half the unit of cavalry. These will be handled as soon as possible – I want to get the project squared away. I also bought some casualty models on the cheap at Crisis 2013, so they’ll be done, too. Despite the lack of interest I love the models, and so the For King & Country set from Warlord Games might be snapped up end of 2014. Frenchmen: Things have been a bit quiet for my Frenchmen this year – if I have any hopes of ever fully owning the French OOB for Quatre-Bras, I’ll have to get going soon! Still, I managed to paint some cannon, a unit of lancers, and some command models and infantry here and there. In 2014: Painting more infantry is top priority for this army – I’m looking at a battalion of lights and two of line to be done. Also some cuirassiers, and some command models and battlefield markers. Merde! Brits: I’ve just started this project but I absolutely love painting Red Devil models. Done so far are an infantry section, command section and light mortar team. Further up this year is the rest of my current collection – another infantry section, a PIAT team and a Vickers team. Just fifteen models, shouldn’t be too hard, right? In 2014: Who knows? With no other Red Devils to work on, these might be considered finished… unless a friend or relative treats me to another helping (and the wishlist function in the Warlord Games webstore is rather helpful). 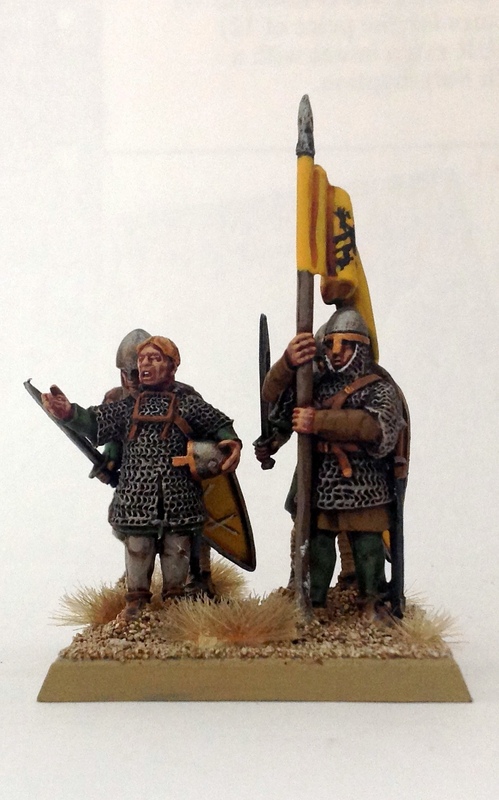 Flemings: I took it easy with this project in 2013, with just sixteen infantry and eight crossbowmen done. However, three commanders are currently on my painting desk, so this year will be ended with a decent batch of models done for them. In 2014: I’d like to have these Flemings as one of my main projects for the year, and I’d also like to finish enough of them for a full Saga warband with options. Later on they might be expanded upon even further, and turned into a Hail Caesar/Impetus army, or even a Bretonnian army for Warhammer Fantasy. Fantasy & Sci-fi: Really quiet on this front! I painted mainly some Bloodletters, some Space Marines (ewww) and some Space Orks, to a total of about 50 models. However, I’m thinking of picking up the gaming side of it fairly soon, and that might get me interested in painting the masses of plastic and lead I have lying about. To conclude, in 2014: More Space Orks and maybe some extra Chaos releases, but no new purchases of any kind for these projects. Japanese: Just bought them at Crisis, will probably have to wait until next year though. So, in 2014: A handful of sohei monks for Ronin, probably around 20. Not much is needed for this ruleset. Commission work: About a quarter of the 500 models I painted this year were done for friends. Chief among these were a full Jomsviking warband and two Napoleonic cavalry units, with more still underway. In 2014: While I will probably accept more commissions, I will do my best to focus on my own projects. Otherwise, I don’t see any of them being completed. I’ll go for a selection of small commissions and see how they proceed. TL;DR version for 2014: More of everything, especially Vikings – but no new projects. As for next year’s painting goal: I’ll start counting from the moment I went over this year’s mark, but next year’s goal is a total of 600 models painted. This means I’m currently at 4/600. Motivating? Hell no! But I’m sure I’ll boost the figure up towards a decent mark soon. Do check back to see the score, my good readers!